It is said, "scratch the soil anywhere in Cyprus and you will find traces of its magnificent past". This is no exaggeration. Evidence of the island's 9,000 years of history is scattered throughout the island. Remains from the Neolithic period bear witness to the existence of an ancient civilization. 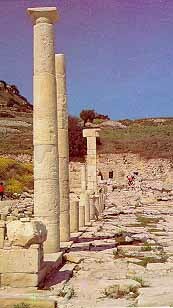 According to tradition many of the ancient cities of Cyprus were founded by the heroes of the Trojan War whom also Hellenised the island. Assyrians, Phoenicians, Egyptians and Persians all passed through the island. This strategically important island was part o the Roman Empire for four centuries. Excavations have brought to light temples and palaces, amphitheatres and baths. Just as magnificent are the early Christian basilicas; equally magnificent are the Byzantine churches with their beautiful mosaics and icons. And then Crusader castles, Venetian fortifications. Cyprus is a living book of pictures taken from world history. Transitional period between the Stone Age and the Bronze Age. Most Chalcolithic settlements are found in Western Cyprus, where a fertility cult developed. Copper is being discovered and exploited on a small scale. Copper is more extensively exploited bringing wealth to Cyprus. Trade develops with the Near East, Egypt and the Aegean, where Cyprus is known under the name of Alasia. After 1400 BC Mycenaeans from Greece reach the island as merchants. During the l2th and 11th centuries. mass waves of Achaean Greeks come to settle on the island spreading the Greek language, religion and customs. They gradually take control over Cyprus and establish the first city-kingdoms of Paphos, Salamis, Kition and Kourion. The Hellenisation of the island is now in progress. The era of prosperity continues, but the island falls prey to several conquerors. Cypriot Kingdoms become successively tributary to Assyria, Egypt and Persia. King Evagoras of Salamis (who ruled from 411-374 BC) unifies Cyprus and makes the island one of the leading political and cultural centers of the Greek world. 333-325 BC The city-kingdoms of Cyprus welcome Alexander the Great, King of Macedonia, and Cyprus becomes part of his empire. After the rivalries for succession between Alexander's generals, Cyprus eventually comes under the Hellenistic state of the Ptolemies of Egypt, and belongs from now onwards to the Greek Alexandrine world. The Ptolemies abolish the city-kingdoms and unify Cyprus. Paphos becomes the capital. Cyprus comes under the dominion of the Roman Empire. During the missionary journey of Saints Paul and Barnabas, the Proconsul Sergius Paulus is converted to Christianity and Cyprus becomes the first country to be governed by a Christian. Destructive earthquakes occur during the 1st century BC and the 1st century AD and cities are rebuilt. In 313 the Edict of Milan grants freedom of worship to Christians and Cypriot bishops attend the Council of Nicaea in 325. After the division of the Roman Empire Cyprus comes under the Eastern Roman Empire, known as Byzantium, with Constantinople as its capital. Christianity becomes the official religion. Empress Helena visits Cyprus and founds the Stavrovouni Monastery. New earthquakes during the 4th century AD completely destroy the main cities. New cities arise; Constantia is now capital, and large basilicas are built from the 4th to 5th century AD. In 488, after the tomb of St. Barnabas is found, Emperor Zenon grants the Church of Cyprus full autonomy and gives the Archbishop the privileges of holding a scepter instead of a pastoral staff, wearing a purple mantle and signing in red ink. In 647 Arabs invade the island under Muawiya. For three centuries Cyprus is constantly under attack by Arabs and pirates until 965, when Emperor Nikiforos Fokas expels Arabs from Asia Minor and Cyprus Kingdoms. The cult of the Goddess Aphrodite flourishes at her birthplace Cyprus. Phoenicians settle at Kition. The 8th century BC is a period of great prosperity. Isaac Komnenus self proclaimed 'Emperor' of Cyprus behaves discourteously to survivors of a shipwreck involving ships of Richard's fleet on their way to the Third Crusade. Richard in revenge defeats Isaac, and takes possession of Cyprus marrying Berengaria of Navarre in Limassol where she is crowned Queen of England. A year later he sells the island for 100,000 dinars to the Knights Templars who resell it at the same price to Guy de Lusignan, deposed King of Jerusalem. Cyprus is ruled on the feudal system and the Catholic Church officially replaces the Greek Orthodox. Which though under severe suppression manages to survive. The city of Ammochostos is now one of the richest in the Near East. It is during this period that the historical names of Lefkosia, Ammochostos and Lemesos are being referred to as Nicosia, Famagusta and Limassol respectively. The era of the Lusignan dynasty ends when the last queen Caterina Cornaro cedes Cyprus to Venice in 1489. Venetians view Cyprus as a last bastion against the Ottomans in the east Mediterranean and fortify the island, tearing down lovely buildings in Nicosia to reduce the boundaries of the city within fortified walls. They also build impressive walls around Famagusta, which were considered at the time as works of military architecture. In 1570 Ottoman troops attack Cyprus, capture Nicosia, slaughter 20,000 of the population and lay siege to Famagusta for a year. After a brave defense by Venetian commander Marc Antonio Bragadin, Famagusta falls to the Ottoman commander Lala Mustafa who at first allows the besieged a peaceful exodus but later orders the flaying of Bragadin and puts all others to death. On annexation to the Ottoman Empire the Latin leadership is expelled or converted to Islam and the Greek Orthodox Church restored; in time, the Archbishop, as leader of the Greek Orthodox becomes the people's representative to the Sultan. When the Greek War of Independence breaks out in 1821, the Archbishop of Cyprus, Kyprianos, three bishops and prominent Cypriots are executed. The Muslim minority during the Ottoman period eventually acquires a Cypriot identity. Under the 1878 Cyprus Convention, Britain assumes administration of the island. It remains formally part of the Ottoman Empire until the latter enters the First World War on the side of Germany, and Britain in consequence annexes Cyprus in 1914. In 1923 under the Treaty of Lausanne, Turkey relinquishes all rights to Cyprus. In 1925 Cyprus is declared a Crown colony. In 1940 Cypriot volunteers serve in the British Armed Forces throughout the Second World War. Hopes for self-determination being granted to other countries in the post-war period are shattered by the British who consider the island vitally strategic. After all means of peaceful settling of the problem are exhausted. a national liberation struggle is launched in 1955 against colonial rule and for union of Cyprus with Greece, which lasts until 1959. According to the Zurich-London Treaty. Cyprus becomes an independent republic on l6th August 1960. It is a member of the United Nations the Council of Europe the Commonwealth and the Non-Aligned Movement. According to the above treaty. Britain retains two Sovereign Bases (158.5 sq. km) on the island at Dhekelia and Akrotiri- Episkopi. The 1960 Constitution of the Cyprus Republic proves unworkable in many of its provisions and this makes its smooth implementation impossible. In 1963 the President of the Republic proposes some amendments to facilitate the functioning of the state and the Turkish Cypriot community responds with rebellion. The Turkish Cypriot ministers withdraw from the Cabinet and Turkish Cypriot civil servants cease attending their offices while Turkey threatens to invade Cyprus. Since then the aim of the Turkish Cypriot leadership acting on instructions from the Turkish Government has been the partitioning of Cyprus and its annexation to Turkey. Using as a pretext the coup of July 1974 instigated against the Cyprus Government by the military Junta, then in power in Athens, Turkey invades Cyprus on July 20, 1974 violating all principles governing international relations and the UN Charter. As a result approximately 37% of the island is occupied, 40% of the Greek Cypriot population violently uprooted and thousands of people, including civilians, killed, ill-treated or disappear without trace. The continuation of Turkish military occupation and the violation of the fundamental human rights of the people of Cyprus have been condemned by international bodies, but until today Turkey refuses to withdraw from Cyprus and maintains the island's division by the force of arms. Turkey has established the Turkish Republic of Northern Cyprus, an illegal state, recognized only by Turkey and continues to maintain the division of the island through force. Following the signing of the EU Enlargement Treaty in Athens on April 16, 2003 and its subsequent ratification by the Cypriot House of Representatives, Cyprus has officialy joined the EU on May 01 , 2004. Copyright CyprusIsland 1999 - 2007 . All rights reserved.